Anze Kopitar, for an awfully long time, led the Kings with 330 consecutive games played between March, 2007 and his broken ankle in March, 2011. The eminently durable Dustin Brown came relatively close several years ago, appearing in 207 consecutive games before suffering an upper-body injury that kept him out of games at Boston and Columbus in December, 2016. But Kopitar’s record fell Tuesday night when Drew Doughty, who hasn’t missed any regular season games since being held out of the lineup for four games at the end of the 2013-14 season, played in his 331st consecutive game. It’s not a shiny scoring statistic, but it’s still one that carries weight for the all-world defenseman. Given the shot blocking and constant battling around the goal and below the goal line, it’s not particularly easy for defensemen to reach consecutive games played milestones. Of the 10 longest consecutive games played streaks in the NHL, eight were recorded by forwards. It was a shoulder injury that caused Doughty to miss his last regular season games, suffered when he attempted to make a hit on Tyler Kennedy in San Jose in April, 2014. He returned for the playoff series against the Sharks and appeared in all 26 games that spring, playing through continued shoulder discomfort, as he noted. 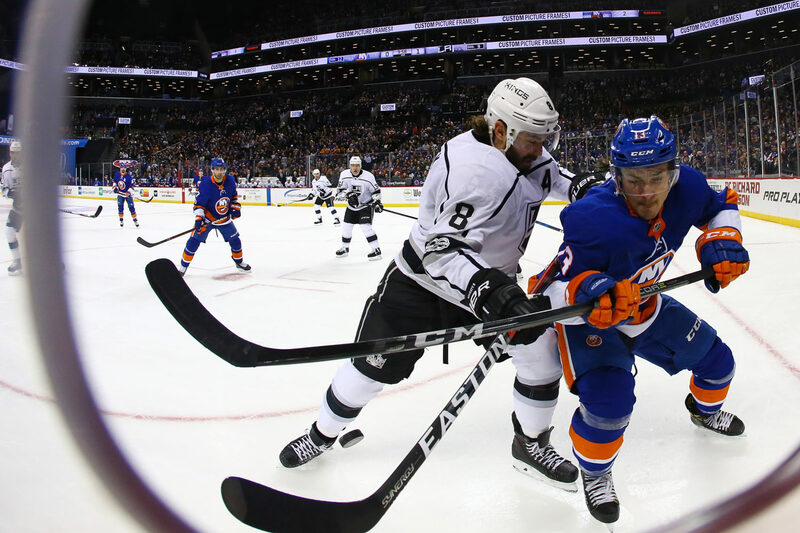 –The Kings are still looking to improve their puck management. Can that challenge be worked out by repetitions in practice, or might a different mindset be helpful? It’s tied in with the team’s desire to play faster. Los Angeles’ team speed has improved, but it doesn’t necessarily take elite individual speed to make quick decisions with the puck. —The possession numbers from Tuesday’s game indicated that the two forwards to spend the most time in the offensive zone were Tyler Toffoli (16 CF, 16 CA) and Tanner Pearson (16 CF, 19 CA). Jeff Carter also had several excellent looks in the third period. Was Tuesday’s game any sort of step forward for that familiar combination? Like several facets of the team’s game, it’s a work in progress. The Kings will get another kick at the can Thursday at Montreal (4:30 p.m. PT / FOX Sports West / FOX Sports app / LA Kings Audio Network).